Dina Kowal Creative: Impression Obsession DT Challenge: Christmas in July! Impression Obsession DT Challenge: Christmas in July! The Impression Obsession girls challenged each other to post Christmas cards this week - the timing is perfect as we all have been working with the new Fall and Winter releases that will be revealed at CHA in a few weeks! So get ready for some sneak peeks! My card uses one of my favorite images from this new release, by Leigh Hannan. I have been loving her fun and funky style more and more, especially with my new markers! I used vintage earthy colors, beginning with Neopiko markers and shading with Prismacolor pencils. Speaking of CHA releases, have you seen Shirley's posts on the I.O. blog about the new Mega Mount and Cover-a-Card background stamps? If you've ever been frustrated by background stamps that don't reach the edges of your card panels or that don't give a complete impression, you'll definitely want to know about these new products! The other girls want you to see their cards too, so be sure to visit their blogs and leave them some love. Their links are to the left! On to blog candy - the winner of the Night Pier set is........ Sandra @ Magnolia & Ivy! Congratulations Sandra - be sure to email me with your mailing address! I'll draw and announce the winner at this same time next week! Leave a comment under this post for a chance to win! Beautiful card! Fantastic colored! You talanted!!! I love IO stamps. Your Christmas card makes me want to go make one right now. Thanks for the chance to win those tropical stamps. I love IO stamps. Thank you for the wonderful chance to win! Your card is absolutley wonderful as always! I also read about the long beans, etc. I love different cultures. How wonderful for you and your children. Love the card! and very nice stamps! GORGEOUS Dina! Love the vintage feel of this one! this set is adorable... crossing my fingers I win it! Very cute card! I love how you colored it! Great card. Love the stamps up for grabs too. I could REALLY use these. Hope I am picked!! Really great stamps! I like the colors you've used - another wonderful card, of course! Love the warm and cozy feeling of this card. Thanks for all you share! super stamps--would LUV to experiment with these!!! Very beautiful card! Your coloring is gorgeous!Thanks for all you share! these stamps are adorable! This set looks like a lazy summer day. This Christmas set looks yummy! Beautifully done! Love the samples I have seen. I really love the Christmas cup et al. So many stamps and so little time. I just love what you have done with this stamp. It looks so yummy! I love looking at all your creations! Thanks for the chance to win this wonderful set! Hot cocoa and candy canes - life doesn't get any better than that. Loving your blog and thanks for the chance to win!! Cute blog candy stamps! I'm lovin the new IO holiday stamps too. Each reveal adds another stamp to my long wish list. Thank you for all your inspiration! Love the cute stamp you chose for your holiday card -- I can always go for coffee and hot chocolate!! You are a very talented lady. this card totally makes me ready for winter and a warm mug of cocoa!!! Soft and inviting!! Love your Christmas card! I need to get started on mine. I love your card- I have a ton of lace, and have been seeing it alot lately on cards......Love your coloring too.....Oh, Christmas will be here before we know it!!! Thanks for sharing your talent and a chance to win images! I joined your blog because your cards are always easy to case! Hey, I am being honest! I love the layouts and stamps you use. Thanks for the chance to win these stamps. Gorgeous stamps - thanks for a chance to win them! Wow, those background stamps sound awesome! I will have to check them out! Thanks for a beautiful sample too....love the lace ribbon! I love your card with the hot chocolate and candy cane! Nice image and great coloring, as usual! Thanks for the chance to win. wow,, sweet tooth time!! Thanks for the chance to win. Your card is beautiful. I love your coloring - - - so wish mine would look like that! Great give away set. thanks for sharing your talent and for offering up a chance to win such a great set. Lovely card! Thanks for the chance to win. Hugs, Nellie. Love these stamps! IO stamps are the best! Love these stamps and the colors you used are just beautiful. Thanks for a chance to win!! I love your card. it has a nice vintage feel to it. Thanks for the chance to win blog candy. Being a Floridian, I use beach stamps alot. I love your cards. Your colors are wonderful. 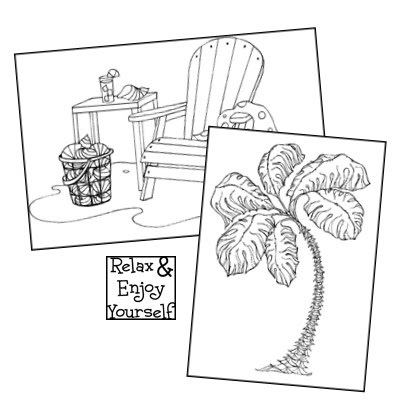 These beach stamps make me itch to get out my Copic Markers! Love your cards, your blog, and the stamp set you are offering as blog candy. Hi Dina! Your card is fantastic and I hope it works out well to have help just come in! I think that would be a lot easier if it were me! Anyway... I LOVE this chair image! I have been looking for one and this is perfect! Thanks for the chance to win!